Liberty Church is hosting its 4th annual car & bike show on May 4th at their location 200 FM 2025 Cleveland TX 77328. Check in is at 10am, judging starts at noon and trophy presentation at 3. Entry is $20 a car/bike, there will be 25+ trophies awarded (new classes to be added for 2019) and the 1st 30 entries receive a free t-shirt, additional t-shirts as well as food will be available for an additional cost. 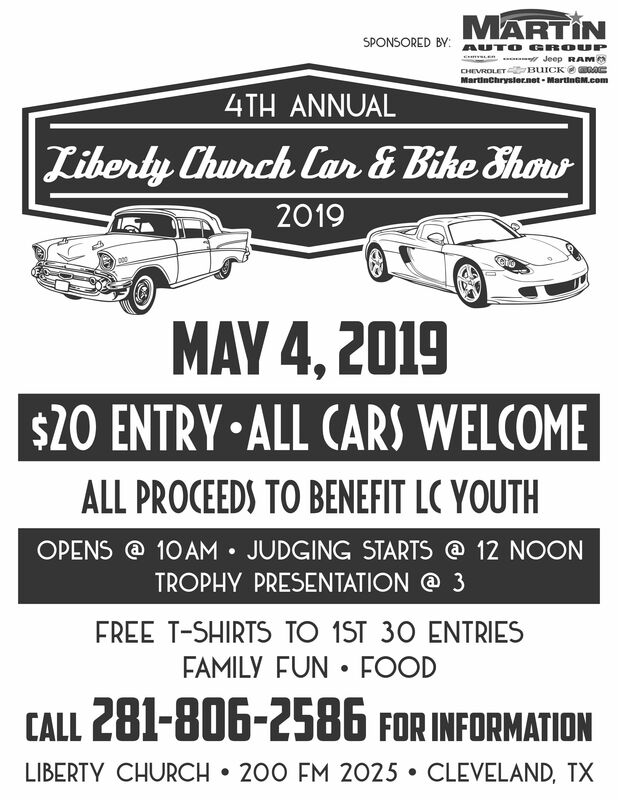 Last year we had an amazing turn out from trucks and muscle cars to exotics and more, help us make this show the biggest church show in the Houston area, and please remember All proceeds from the show, shirts and food will go to benefit the Liberty Church Youth Department. Please help us make this show an amazing event and help contribute to a great cause.